When Reaver was born I was on the phone with Sanja, so this owner was there from the start. Reaver had inhaled some fluid and as I was sucking it out she put her tongue in my mouth! She has always had an impressive vocabulary – as a blind pup crawling around the whelping box, whenever she hit a wall she would protest loudly in frustration. When the pups were given their first chicken wings at 3 weeks of age, she pounced on a wing tearing flesh from bone while growling ferociously – a real character! 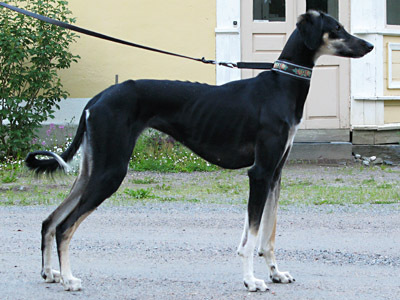 Reaver is Hyde's and Sanja's (kennel Non Serviam) pup, placed on breeding terms with her mistress Annukka, who initially encountered the breed in Yemen. 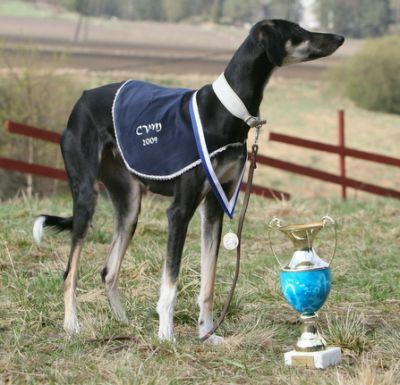 Reaver has three lure-coursing CCs and three wins. She began racing in 2009 and among other placements was second in the Racing Derby at Tampere. Reaver has a name with somewhat ominous connotations, but unlike some of her namesakes found in popular culture, she is no feral cannibal or a demented devourer of souls. Instead, Reaver is the kind of dog that anyone would surely like to have. Good as gold in any situation, endlessly optimistic, happy-go-lucky, a natural born hippie going undercover in stylish Goth colours, Reaver never has a bad day, greets every stranger as a potential new best friend and generally does an admirable job of maintaining a positive attitude to life. A city-dweller could not hope for a better companion: Reaver does not engage in stealthy home improvement projects or operatic lamentations when left alone during the day, nor does she feel the need to build up her ego by noisily showing off during walks. She has nerves of steel, riding escalators, tram cars and the metro with equal ease, playing with pit bulls and miniature poodles at a dog park, occasionally giving local city hares a run and generally enjoying herself wherever she happens to be. During the last one and a half years, Reaver has lived in a student commune, a 15 sq meter apartment in central Helsinki and amidst a pack of dogs in rural France among other places, and been thoroughly at home in all of them. Fortunately for an owner who likes to travel a lot and pack light, Reaver is also remarkably easy to feed, as she can (and does) devour everything that drops into her bowl: cheap supermarket kibble, vegetable curry, raw meaty bones as well as organic state-of-the-art super-costly dog food from a specialist supplier - all gets wolfed down with equal enthusiasm, with no ill effects. Accordingly, food has proven to be an excellent training tool for obedience and agility, but I especially like the fact that Reaver can also be motivated easily with toys, which doesn't always seem to be the case with salukis. Does Reaver have any faults? Well, not really, unless you put great importance on show success. Let's face it, the utilitarian looks of this particular hound will probably never appeal to most judges. Also, she can sometimes be rather noisy when playing outside with other dogs, which is not so nice for the owners' ears. However, to use a familiar software developer's phrase: these are not bugs, they are features! As a matter of fact, if all dogs had features like Reaver's, I could (and would) easily own ten of them.